Man where does the time go! As I have mentioned in a previous post this has been a crazy week, and again I am sorry this is late. Between the crazy week, and wanting to rip my own head off, everything is a little late this week. The Adventure this week takes us to a Tangle that is perfect for monotangles. It also happens to be another of my favorite tangles. This week your adventure should you choose to accept it is a little tangle called Auraknot. Here is a link to it on tangle patterns. 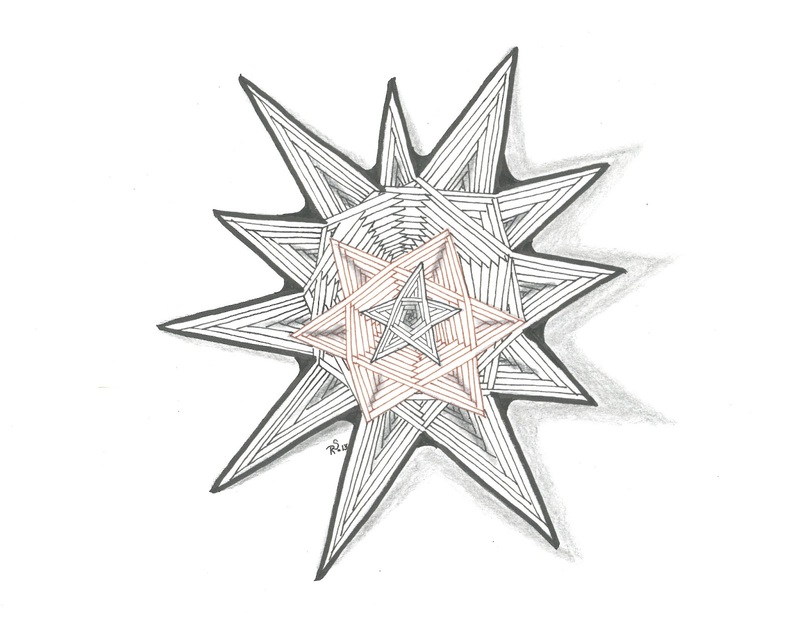 If you have not already watched the video I recommend you do, it make the tangle easier to understand, and I just love watching Maria do any Zentangle®. 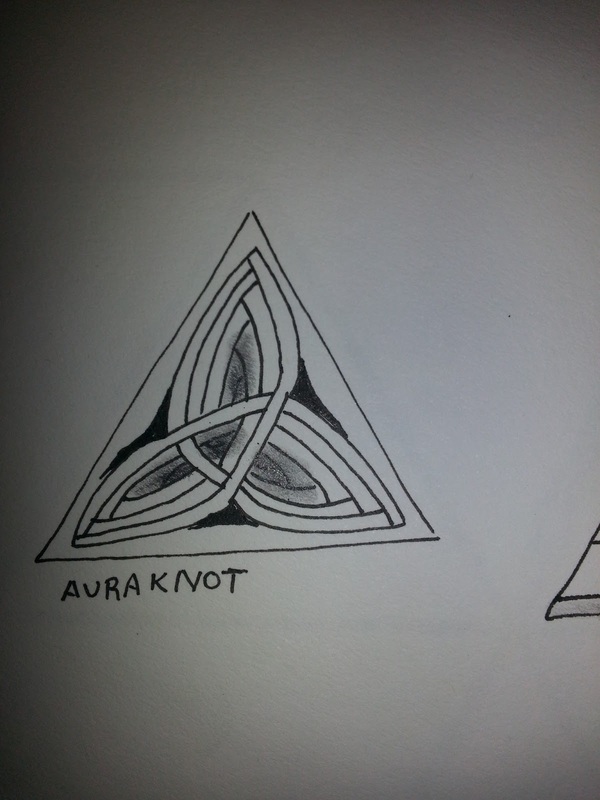 Part of the reason this is late is I was working on a ZIA, that had 5 Auraknots linked together, and with my headaches, it just did not (or knot) workout, so I had to do another piece. 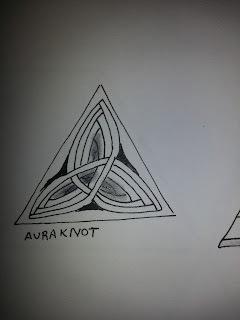 Here is my hastily done Auraknot monotangles. Here is my Auraknot for the ongoing adventure. Thanks again for joining in on this Advanture! Hi Roy, sorry to hear about your headaches, hope that will be better soon. I think you gave the wrong number to this Adventure, last week we had nr. 005. Ugghh! you are correct. That's just how the week is going. Oh well, I have fixed it now. Thanks for pointing it out to me. nope...not fixed now. (well, the lack of link that is) tee hee. But man...i feel your pain when it comes to headaches. Im pretty sure I will have organ damage from all the advil ive taken in my life. I hope the docs can find you some relief. Auraknot is wonderful isn't it? Susan you link is not working, when I click it I get the message "This is not the page you're looking for." If you add a new link I can remove the dead link. I took some liberties with this monotangle. 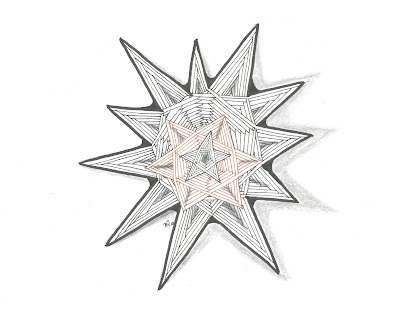 Once I quit worrying about making six-pointed shapes, I had fun! another new pattern for me and I love it.